By the time you finish reading this sentence, there will have been 219,000 new Facebook posts, 22,800 new tweets, 7,000 apps downloaded, and about $9,000 worth of items sold on Amazon… depending on your reading speed, of course. Now that the Internet is widely available, just one second of global online activity is jam-packed full of events, from communication with others to data storage to entertainment options galore. For example, in the amount of time you've been on this page, this is how much data has already passed through the Internet. The amount of data uploaded to the Internet in a single second is a staggering 24,000 gigabytes. Cisco forecasts that monthly Internet data will reach 91.3 exabytes – or 1 billion gigabytes – by the year 2016, pushing the amount of online activity even higher. These real time Internet statistics show just how vast the Internet is, not to mention how much it's growing every day. We even included the real time website statistics of the Internet's heaviest hitters. From these web usage statistics, it's clear to see — though still hard to believe — that the Internet is growing bigger by the second! Want to know what else happens in single second online? 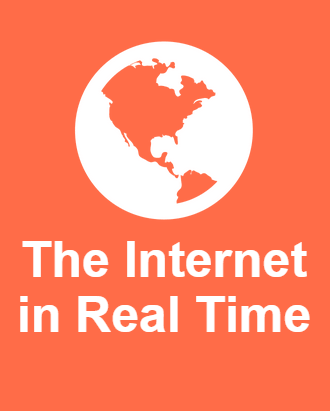 Check out the real time stats we've accumulated for the Internet's favorite websites. Scroll down to find out what has happened on the Internet just since you loaded this page! Even as rumors fly about teenagers abandoning Facebook in droves, this social media network is still growing exponentially. Every day, Facebook users like an average of 4.5 billion posts, share more than 4.7 billion status updates with their friends or followers, and watch over 1 billion videos. Twitter’s average TPS – or tweets per second – is in the ballpark of 5,700. The last time a major spike to the TPS was experienced was in August of 2013, when Japanese users watching Studio Ghibli’s “Castle in the Sky” spiked the activity to a record 143,199 tweets each second. Not even the 2014 World Cup was able to beat this per-second record: the final moments of the Germany-Brazil semifinal clocked in at only 9,669 TPS (but it did set a record for most tweets per minute). LinkedIn, the social media site for professionals, has become a hotbed of activity for those looking for coworkers to connect with, recommendations to add to their profile, new career opportunities, and now even content to read and share. In 2012, professionals performed more than 5.7 billion searches on LinkedIn, which breaks down to more than 180 searches per second. Instagram, which recently reached the 300 million monthly active user mark, continues to grow at breakneck speed. Presently, the app sees 2.5 billion likes daily – more than 28,000 every second – and 70 million new photo uploads per day. Before Foursquare split into two apps in 2014, the company reported receiving more than 6 billion check-ins daily from over 25 million users. Swarm currently sees an average of 71 check-ins per second worldwide. Pinterest users pin approximately 3,472 images to the site per minute. It’s also been reported that 80% of all of the site’s pins are repins, proving just how long the shelf life for Pinterest content really is. Swipe left, swipe right. Dating app Tinder’s explosive growth has resulted in more than 600 million swipes per day, which means there’s something like 6,944 swipes happening each and every second. In early 2014, messaging app WhatsApp claimed to be adding more than 1 million new users each day, which would put the amount of new account creations somewhere in the ballpark of 12 per second. Additionally, with more than 27 billion individual messages sent per day – yes, that’s billion, with a b – WhatsApp appears to have become a serious rival to text messaging, an enormous achievement for a voluntarily installed application. In February 2013, Snapchat was hosting 60 million messages per day. Now, as of May 2014, users are sending upwards of 700 million photos and videos through the app daily – or about 8,100 every second. Stories, introduced in 2014, receive a total of 500 million views per day, meaning about 5,787 are viewed every second. Microsoft’s cross-platform calling software currently handles approximately 2 million minutes of video, audio, and chat connections each day. This breaks down to 23,148 minutes worth of data – or 385 hours – being used every second. Amazon closed its 2013 fiscal year with $74.4 billion dollars in net sales, which breaks down to $2,361 in sales per second. If you think that’s impressive, consider this: the site broke its own record on Cyber Monday 2013, reportedly selling up to 426 items per second at its peak. The site had previously recorded selling 306 products per second in 2012. As of 2013, Google was seeing over 2.1 trillion searches from both desktop and mobile devices annually. This breaks down to more than 68,000 searches being performed every second. On the advertising side of things, Google reported earning more than $50 billion in ad revenue in 2013, netting them around $1,602 in profit per second – not as much as Amazon, but still a pretty huge number! Kickstarter’s 2013 roundup reported that a total of 3 million people pledged $480 million to more than 19,000 successfully funded projects. Approximately $1.3 million was pledged each day, which breaks down to $913 every minute. Another fun fact: 975 ambitious people backed more than 100 projects on the site! When it broke the 100 million unique visitor mark in January 2013, Yelp announced that it had seen more than 1 million reviews written that month alone, which breaks down to a new review every two seconds. Also, it was noted that every second on Yelp, consumers generated directions to a business, or used the mobile app to call one for information. The amount of email we send, receive, read, and delete every day is enormous – and it’s growing, even as alternative communication solutions arise. Currently, 182.9 billion messages are sent and received every single day, which breaks down to more than 2 million messages exchanged per second. But considering around 70% of email is spam, it’s hard to say how many of those messages are ever actually read. According to dropbox, this cloud storage platform has more than 300 million users who save approximately 1 billion files every 24 hours. 97% of Fortune 500 companies use the app – impressive for a piece of software less than ten years old! According to WordPress, between blogs hosted on WordPress.com and self-hosted blogs with the Jetpack plugin, there are 42.6 million new blog posts published every month. More than 409 million people read over 18 billion pages on blogs each month. As of October 2014, over 63 million comments are posted monthly, compared to 36 million just one year before. When Yahoo! acquired Tumblr in May 2014, Yahoo! CEO Marissa Mayer stated that the site had more than 300 million monthly visitors, 120,000 new users each day, and an incredible 900 posts per second. Tumblr currently hosts more than 105 million different blogs, and half of the site’s users access blog content through the mobile app. In the 10 years since its inception, Flickr has grown its photo sharing platform to boast over 92 million users and 2 million groups. Approximately a million photos are uploaded to the site every day, which was acquired by Yahoo! in 2005.
reddit is a popular site, and if its explosive growth over the last three years is any indication, it’s only going to get bigger. With more than 21 million upvotes and downvotes being cast daily – about 252 per second – the site is a hotbed for social activity. On average, Android users download and install a collective 2.5 billion apps per month, which averages out to about 964 new app downloads per second. This represents a huge amount of growth for the Android OS, which grew from 400 million device activations in 2012 to 900 million in 2013. Apple’s App Store, which turned six in July 2014, now offers iOS users more than 1.2 million free and paid apps for download to multiple devices. Since the App Store’s inception, apps have been downloaded more than 75 million times, which averages out to something in the neighborhood of 800 downloads per second. According to YouTube, more than 1 billion unique users visit the site each month and consumer over 6 billion hours of video – almost an hour for every person on Earth. Every second, approximately 2,314 hours worth of video is consumed. Additionally, 100 hours of new video is uploaded to YouTube each minute. In Q2 2014, a study by The Diffusion Group found that total Netflix streaming time had risen to 5.1 billion hours during this three month period. This breaks down to 655 hours worth of video data being streamed by viewers every second of every day. The group also found that the average user watches more than 90 minutes worth of video on the service every day. Spotify streamed a total of 4.5 billion hours of music in 2013, a number that will only go up as the service continues to spread to the rest of the world. In February 2014, Avicii’s hit “Wake Me Up” featuring Aloe Blacc became the first track to be played more than 200 million times, and the most streamed song in Spotify’s history. Between February and December of 2013, 15.31 billion hours of music were streamed on Pandora. A little math breaks this down to 532 hours worth of music being streamed each second – the equivalent of The Dark Side of the Moon being played 742 times. Like numbers and pretty charts? Check out our study on Windows XP usage in the US.